The RiversEdge Products Model 27.300M Therapy Bar Storage Rack is a simple, yet functional design to hold your Therapy and Barbell Bars while not in use. 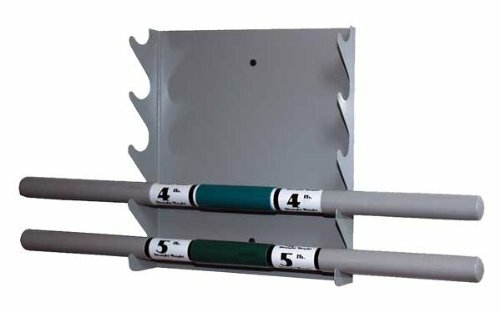 The Rack attaches to your wall studs with the included mounting hardware. Finished with a neutral medium gray powdercoat, the Rack will blend easily with any decor. There are no weight bars included with the storage rack. If you have any questions about this product by River's Edge Products, contact us by completing and submitting the form below. If you are looking for a specif part number, please include it with your message. Titan Fitness Olympic Barbell 5 Bar Holder Vertical Storage Display Rack 12"x12"
Titan Fitness Deluxe Olympic Barbell 5 Bar Holder Vertical Storage Rack 12"x12"